We believe this is the future of psychology and are looking forward to training the next generation of behavioral health providers in our model. Work closely with medical and dental providers as part of CHC’s model of integrated care. Develop clinical and assessment skills with clients of all ages in a variety of settings, including in primary care settings, licensed outpatient mental health clinics, schools, homeless shelters and domestic violence shelters. Gain or build upon experience using electronic health records and other state-of-the-art technologies to manage and deliver care. Complete psychological assessments to assist primary care providers and members of the behavioral health team in clarifying diagnosis and developing care plans. Participate in a range of training seminars and supervision covering individual, family and group treatment and behavioral health within primary care. Be involved in performance improvement, quality improvement and research opportunities. Receive the same clinical and administrative support as other behavioral health clinicians. Where are training and services provided? Integrated behavioral health services are provided in 14 licensed clinics, more than 40 school based health centers, and 8 programs in domestic violence and homeless shelters across Connecticut. The CHC headquarters is located in Middletown, CT with primary training locations in the Clinton, Danbury, Hartford Middletown, Meriden, New Britain, New London, Norwalk, Stamford, and Waterbury sites, with some service delivery possible at other sites. Through teleconferencing, CHC is able to provide face-to-face supervision to our residents and full-time access to the training director and supervisors. CHC’s Postdoctoral Clinical Psychology Residency Program is “accredited on contingency” by the Commission on Accreditation of the American psychological Association. Applicants must have completed an APA/CPA accredited doctoral program. We do not require that applicants completed an APA/CPA accredited doctoral internship, although the internship experience should meet APPIC standards. All requirements for the doctoral degree must be completed before starting the postdoctoral training program and these requirements will be verified by CHC staff. After written material is submitted and reviewed, candidates are selected and invited to interview. Upon completion of the interview day, candidates are re-evaluated and offers are extended on the Uniform Notification Date until all spots are filled. Our program adheres to APPIC’s guidelines for notification. As a Psychology Resident, the successful applicant will be hired as a full time contracted employee of Community Health Center, Inc for the postdoctoral year. In addition to the above information, we will require our standard employment application be completed and a contract signed. Residents will be introduced to some of the benefits offered to full time employees by our Human Resources department, including paid time off, medical insurance, and due process/grievance procedures. What makes the CHC program unique? The Community Health Center, Inc. has been given the highest recognition by NCQA as a Level 3 Patient Centered Medical Home. PCMHs are the future of healthcare. In addition, our Behavioral Health program operates as a part of the primary care service delivery system at CHC, giving residents the opportunity to be trained to provide care in this model. CHC is a multi-site agency. Where is the training program located? Community Health Center, Inc. delivers service in over 200 locations across Connecticut. Behavioral health services are provided in 12 licensed clinics, more than 40 school based health centers, and 8 programs in domestic violence and homeless shelters in central Connecticut. The headquarters is located at 675 Main Street in Middletown. Primary training locations include Clinton, Hartford, Middletown, Meriden, New Britain, New London, Norwalk and Stamford, with some service delivery possible at other sites. September 1, 2019 and continues through August 31, 2020. Is the postdoctoral program full-time? The postdoctoral resident is required to work 40 hours per week. Residents receive paid time off and holidays. The program is one year. In this time residents will complete postdoctoral hours needed to meet the requirements to be eligible for licensure in the state of Connecticut. A stipend of $50,000 is offered for the year. Residents are hired as one-year contracted employees of CHC with insurance benefits and paid time off. Are there any particular days or hours required? Residents are expected to be at CHC five days per week, at least one evening per week until 6 p.m. at most clinics (please note that late hours differ by clinic, but are no later than 7 p.m.) and a minimum of one Saturday per month to meet the needs of our working clients. The seminar schedule will also dictate the resident’s schedules. Is there some flexibility in the kinds of activities/opportunities that the postdoctoral resident will have? All residents will be expected to focus on outpatient clinical treatment in the primary care clinic setting. Specialized settings, including shelter-based and school-based work, are available at most sites and may be required. While Spanish language proficiency is preferred for all sites, it is essential for some. Residents will be expected to use the phone-based translation service to provide care to clients whose preferred language is not English. All treatment rooms are equipped with speaker phones. Does CHC utilize an electronic health record system? Yes. Residents will be trained in the use of eClinical Works, CHC’s integrated electronic health record, which allows access to clients’ medical, behavioral health and dental records. Will I be eligible for state licensure after completing the residency program? Upon completion of the program, residents will have the necessary supervised clinical experience to qualify to sit for the EPPP and CT state exam for psychology licensure. Is this residency program eligible for federal loan forgiveness programs? No. Psychologists must be licensed to qualify for the National Health Service Corps loan forgiveness programs. CHC is qualified as a site for this program for licensed psychologists. What are your administrative policies and procedures? Please review our manual here. The goal of the Postdoctoral Psychology Residency program is to train the next generation of psychologists in the Patient Centered Medical Home model. Through weekly seminars, group and individual supervision and clinical work with diverse, underserved populations, residents will fine-tune assessment and therapy skills. In order to complete the residency, the resident will be required to demonstrate advanced proficiency across listed goals and objectives. Through clinical experience, supervision and didactic seminars including related readings, residents will develop an understanding of behavioral theory and research as applied to primary care settings. Through engagement in didactic seminars, residents will gain an understanding of relevant research regarding evidence-based interventions used for brief therapies within the primary care setting. Through didactic seminars, residents will learn about work with underserved populations, how to address psychosocial issues as part of the therapeutic process and will gain experience working with this population during clinical time. Goal #2: Treatment Planning: Residents will develop an understanding of the social determinants of health, how chronic, co-occurring medical conditions affect mental health and use this knowledge to create an effective plan of care for each patient. Through didactic seminars and clinical experience, residents will be able to conduct very brief psychosocial assessments (“warm hand-offs”) and will be able to ask information relevant to case based on information from the medical provider. Residents will be able to make an accurate diagnosis and preliminary plan of care based on results of the warm hand-off. Through clinical experience, residents will learn about other disciplines including medical, dental, chiropractic, nutrition and nursing. Goal #4: Cultural Competency: Residents will gain experience working with diverse and often underserved populations and will demonstrate cultural sensitivity and competence in providing effective mental health care to medical patients of different backgrounds. Through didactics and supervision, residents will learn an approach that integrates cultural identity, health beliefs, and illness history that impact health behaviors. Through supervision and clinical experience, residents will learn sensitivity to issues of diversity and adjust treatment planning and intervention strategies in response to cultural factors. Through supervision and didactic training, residents will demonstrate sensitivity to patient cultural diversity, including race, ethnicity, religion, country of birth, gender, social class, age, sexual orientation, disability and health status, as well as other individual differences. Residents are encouraged to explore their own cultural background and resulting attitudes and biases to promote personal growth and sensitivity to others. Goal #5: Ethics and Professional Development: Residents will demonstrate knowledge and application of the APA ethical code and laws specific to patients treated in Connecticut as reflected in clinical practice. Residents will grow in their capacity to demonstrate appropriate professional conduct within an integrated care setting, within the field and within the communities in which we serve. Residents will gain a thorough understanding some of the complexities regarding privacy and confidentiality when working from a shared medical record in an integrated primary care setting. Residents will have funding made available to join professional organizations, will learn about working with legislators to advocate for our patients and will have opportunities for interactions with established community leaders in the field of psychology. Through didactic seminars, residents will review issues related to ethics and the law, present cases of “dilemmas” and using the APA Code of Ethics and state statutes will develop a plan to ensure adherence to ethical standards. Through clinical experience and supervision, residents will gain knowledge of complex ethical issues that arise in treating patients within an integrated primary care setting. Goal #6:Program Development: Residents will learn about healthcare systems improvement beginning with organizational assessment, planning for structural transformation, implementation of systems improvement, and evaluation of change. Residents will learn quality improvement strategies and work as a multidisciplinary team to improve healthcare performance including the agency’s ability to meet UDS goals. Residents will have the opportunity to participate in agency quality improvement initiatives including the Dartmouth Clinical Microsystems Approach to healthcare performance improvement. Residents are encouraged to engage with leadership in process improvement and to provide input for changes to healthcare delivery to help make our system more effective and efficient. Residents are invited to attend the yearly Weitzman Symposium, highlighting innovations in healthcare delivery within primary care. CHC is a multi-site agency with locations across Connecticut. Residents are given a “home office” location at a fixed clinic site and may see patients in schools, shelters, and other non-traditional treatment settings. The resident’s supervisor works at the fixed-site location. Residents meet weekly in-person for group supervision, seminars and on an as-needed basis for other training opportunities, such as orientation and Grand Rounds. Some sites require additional travel time. CHC has an excellent video conferencing system that allows staff from all of our sites to meet as needed. When residents are not meeting in person, they are able to meet face-to-face via video. Throughout the year, New Innovations will be utilized to maintain an ongoing evaluation of residents’ experiences and growth, as well as evaluation of the program and individual seminars. We have institutional policies in place for due process in the event of a grievance. Residents spend 32 hours of their week in direct service delivery on site providing services to clients and participating in the procedures of the clinic. Eight hours a week residents attend training seminars and complete group supervision. All residents will be expected to focus on outpatient clinical treatment in the primary care setting. Some sites offer the opportunities for shelter-based and school-based work. Supervision is provided by psychologists licensed by the state of Connecticut. These psychologists work at our sites across Connecticut. Each resident will have a primary supervisor affiliated with the site where he or she is located. Secondary supervisors may work at other locations. Residents may be asked to drive to other sites for meetings with their secondary supervisors or for didactic training. Didactic training is provided by the multidisciplinary team at CHC, including but not limited to psychologists, social workers, medical doctors, and advanced practice registered nurses. Kerry Bamrick, MBA is the Program Director for all of CHC’s Post-Graduate Residency Training Programs. CHCI’s residency programs include: the Nation’s First Nurse Practitioner Residency Training Program, Post-Doctoral Psychology Residency Program, Psychiatric Mental Health Nurse Practitioner Residency Program, Center for Key Populations Fellowship and Weitzman Institute Administrative Fellowship. Kerry is also responsible for overseeing and coordinating all aspects of CHCI’s remotely-hosted nurse practitioner residency programs across the country. In addition to ensuring the successful operation of CHCI’s various residency training programs and remotely hosted nurse practitioner residency programs, Kerry also serves as CHCI’s Institutional Review Board (IRB) Administrator. Chelsea McIntosh, Psy. D is the Training Director for the residency program as well as the On Site Behavioral Health Director for the clinics located in Stamford and Norwalk. She was a previous resident in the program. Dr. McIntosh obtained her undergraduate degree at Drew University and her doctorate in clinical psychology from Baylor University. Dr. McIntosh trained as a generalist, working across a diversity of settings such as probation, adolescent residential, university and other educational settings, as well as the outpatient setting. Her clinical interests focus on interpersonal, systems based work, and the implementation of general practice, taking evidence based treatment and adopting it to various populations and settings. An additional interest is the development of clinical identity and how it impacts ethical decision making and the therapeutic relationship. Kate Patterson, Psy.D. serves as the Clinical Director of the Lillian Reba Moses Child Guidance Clinic and as a supervising psychologist and coordinator of various programs including multidisciplinary evaluations through the Department of Children and Families. CHC’s externship program was developed and implemented by Dr. Patterson and will be entering its third year. In addition to her work at CHC, Dr. Patterson is an adjunct professor at a neighboring graduate program in counseling. She received her undergraduate degree from Central Connecticut State University and continued on to pursue a doctorate from Antioch University New England in Keene, NH. Dr. Patterson, a Connecticut native, has dedicated her career to working within local systems of care including a maximum security prison, the VA health care system, and outpatient work both within a clinic setting and in the home. At CHC, Dr. Patterson works with clients across the age range, but has a particular interest in working with children and adolescents. Regarding research, Dr. Patterson has an interest in countertransference and its influence on working with different social classes. This construct is often applied in her clinical work and is a key aspect during supervision with her residents and externs. Erica Preston, Psy.D. is a staff psychologist at the New London site. Dr. Preston completed her undergraduate work at Northwestern University and earned her Psy.D. from the University of Hartford. 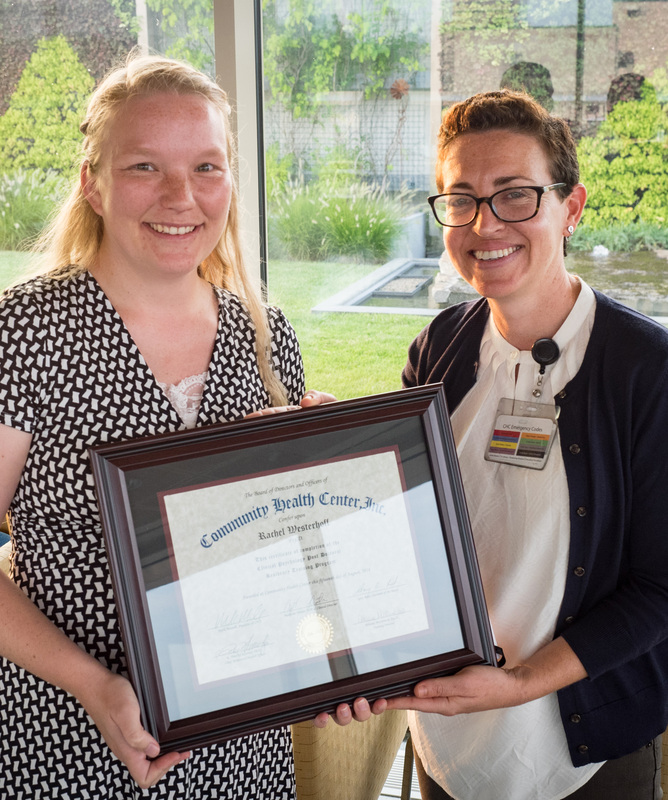 Dr. Preston completed her post-doctoral residency at CHC as part of the first class of post-doctoral residents and went on to become a permanent staff psychologist at CHC. Dr. Preston works with adolescents and adults and specializes in psychotherapy with the LGBT population, specifically people who are gender variant. She also has a research background in the process of conducting psychotherapy with transgender people who are in the process of transitioning. LaKisha Grant-Washington, EdD is the Program Coordinator supporting the operations of the Psychiatric Nurse Practitioner Program, Post-Doctoral Psychology Residency, Administrative Fellowship Program and CHC’s remotely hosted Family Nurse Practitioner Programs. Prior to joining CHC, LaKisha worked in higher education for over 10 years. She has extensive experience in academic instruction, curriculum development, and program implementation. LaKisha holds a Doctorate in Education from New England College, a Master of Science in Forensic Psychology from American International College, a Bachelor’s degree in Psychology with minor in Management and Organization from Central Connecticut State University. Jennifer Bumpus, PsyD. LCSW is a licensed clinical psychologist, as well as a licensed clinical social worker and works as a clinician in the Meriden site. Dr. Bumpus obtained her doctorate in Clinical Psychology from Antioch University New England in Keene, New Hampshire and was a member of CHC’s second class of Psychology Postdoc Residents (2012-2013). One of her passions is Child Welfare, as she worked for over a decade for the Department of Children and Families in CT in a variety of social work related roles, prior to obtaining her doctorate. Some of her clinical interests include working with children, adults and families around the issues of divorce, loss, adoption/ foster care, ADHD, depression, anxiety and trauma-related issues. Dr. Bumpus has engaged in research on the racial identity development, resilience, and self-esteem of transracially adopted African American children and is interested in a variety of multicultural issues and their effects on children and families. Dariush Fathi Psy.D. is the On Site Behavioral Health Director at the Danbury site. Dr. Fathi works on the front lines addressing the opioid crisis and partnered with physicians, nurse practitioners, nurses and medical assistants to develop CHC’s outpatient suboxone treatment program for adults with opiate addiction. Dr. Fathi trains and supervises behavioral health trainees from different disciplines, including doctoral psychology, advance nurse practitioner, and counseling students. He received his undergraduate degree from the University of Waterloo and his graduate degree from Nova Southeastern University. Dr. Fathi completed his doctoral research in outpatient substance abuse treatment, with and developed interventions that can be used from home to help patients overcome their addictions. He has extensive training in evidence-based approaches including cognitive behavioral therapy, dialectical behavior therapy, and mindfulness. He also has training in psychodynamic therapy, and uses an integrated approach in his work with patients. Victoria Ramos, Psy.D. currently serves as the On-Site Behavioral Health Director for the Meriden site. Dr. Ramos is bilingual and bicultural and provides services in Spanish to CHC’s large Spanish-speaking population. She obtained her generalist training in clinical psychology from the University of Harford in 2008. Her interests lie in psychological assessment, multicultural issues, and trauma-focused treatment. Allan Stebinger, Ph.D is a staff psychologist at the Middletown site. He obtained his Ph.D. from the New School for Social Research. He has worked in community health since 1994. His current clinical interests include dual diagnosis patients, (he is certified in substance abuse counseling), and suicide assessment.